The immigrant experience is life turned inside out – children (sometimes alone), teenagers and families leave everything behind in their home country, and start over again in a strange new country. The idea for this post began with Stepping Stones: A Refugee Family’s Journey. Browsing through our local bookstore, this book leaped out at us, with extraordinary collages by a Syrian artist, Nizar Ali Badr. He makes his art from small smooth stones gathered on the beach. In the midst of a continuing war today, this book speaks volumes. 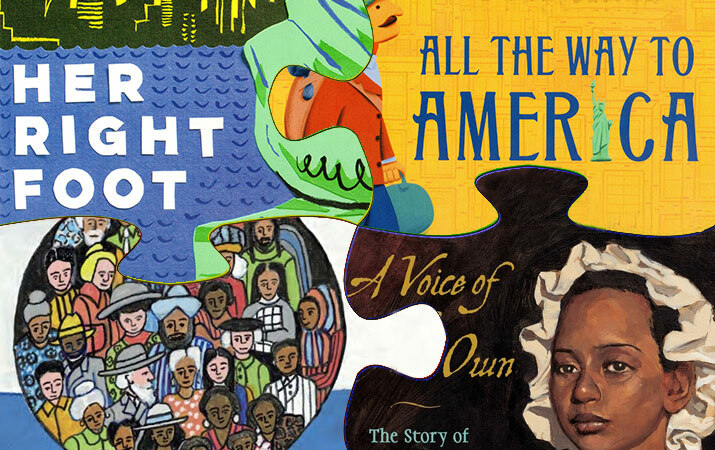 Children’s books open doors into worlds of difference, and create inspiring stories of hope, courage, new ideas, social change, and challenges of immigrants in America. Her Right Foot by Dave Eggers, Shawn Harris. Note: The Statue of Liberty is an immigrant too – the statue was made in France and brought to the United States. A Voice of Her Own: The Story of Phillis Wheatley, Slave Poet by Kathryn Lasky, Paul Lee. Islandborn by Junot Diaz, Leo Espinosa. We Came to America by Faith Ringgold. From every country in the world. What Was Ellis Island? by Patricia Brennan Demuth, David Groff. All the Way to America by Dan Yaccarino. My Name is Yoon by Helen Recorvits, Gabi Swiatkowska. Skating with the Statue of Liberty by Susan Lynn Meyer. The Keeping Quilt by Patricia Pollaco. Coolies by Yin, Chris Soentpiet. Irving Berlin: The Immigrant Boy Who Made America Sing by Nancy Churnin, James Rey Sanchez. “God Bless America” was composed by Irving Berlin. As a child, he came with his family to the United States from Russia; Irving and the passengers sang as the ship passed by the Statue of Liberty. His family was poor, when his father died, he went to work selling papers, but Irving always sang popular songs. At 19, he wrote his first song, and then “Alexander’s Ragtime Band” – Irving was famous. Yes ! We Are Latinos by Alma Flor Ada, F. Isabel Campoy, David. Diaz. My name is Julio. I am Zapotec. I live in Stockton California. I am Latino. My name is Monica. I am from El Salvador. I live in Houston. I am Texan. I am Latina. Electrical Wizard – How Nikola Tesla Lit Up the World by Elizabeth Rusch, Oliver Dominguez. Angel Island: Gateway to Gold Mountain by Russell Freedman. The Camping Trip That Changed America by Barb Rosenstock, Mordicai Gerstein. 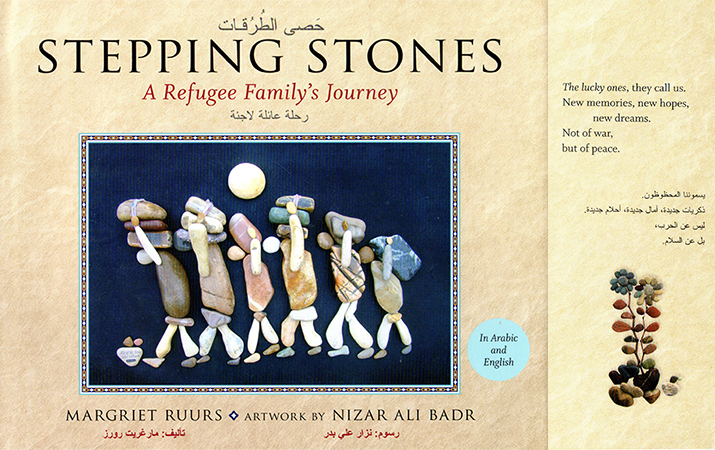 Stepping Stones: A Refugee’s Family’s Journey by Margriet Ruurs, Nizart Ali Badr. Free to play, free to go to school. Free to laugh and chat and drink tea with neighbors. When war comes to their country, people begin to leave the village, a river of people hoping to find a place where bombs don’t fall, killing people on their way to market. The family says goodbye to the flowers in their yard, their goat, and they begin walking. New neighbors welcomed us with open arms. I heard their voices but didn’t understand their words. But when I saw their smiles, I knew what the words meant. Tip: Portion of proceeds from sale of this book go to refugee resettlement organizations across North America.